When i was little, i used to play around the Calder and Greenhall. During the late 70’s, i noticed very prominent markings on a stone that appeared to be standing. It was in a location very accessible on the northern bank of the Calder just beyond the iron bridge (at the bottom of the steps at Greenhall). In recent years, I’ve re-visited the site a couple of times and until just a few weeks ago always believed several misleading articles that suggest that the indentations (known as cupmarks) are bronze age or ancient in some way. I’m sorry to say that’s incorrect. The true sculptor is revealed and the markings are found to have a very “modern” beginning, just as the stone carvings at Priory. It would appear Blantyre residents of olde, like to try and fool future generations, and they just about succeeded! I must say thanks to Blantyre Project reader Ean S Paul, who wrote to me to clarify the mystery. 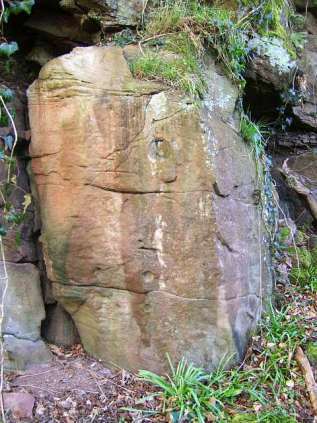 The markings were carved by Ean’s Uncle George and Uncle Andrew during the mid 1920’s. Ean’s father who was the youngest brother, showed them to Ean over 60 years ago when the family lived nearby at Greenhall, explaining how they were made. Being the youngest of the brothers, Ean’s father was apparently annoyed at the time in not being permitted to take part grinding out the cupmarks, as he was too little. The brothers got the idea from visiting the Outer Hebrides and the Highlands where such marks can sometimes be found. The mystery solved, we record and confine this story to the archives and i’m sure Ean’s family can smile wryly at the scrambling around that people have had over the years in their search for the truth.